Last week, Super Junior member Kim Hee Chul as the top trending topic on popular micro blogging site twitter. Well, the story has picked up some steam across the internet and now a newspaper in California has written about this in the actual print edition. 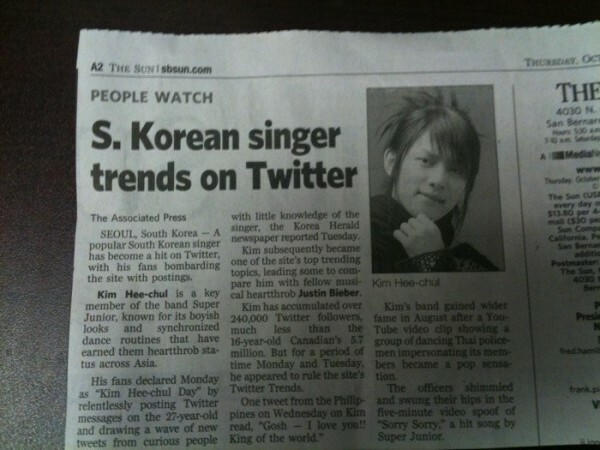 A popular South Korean singer has become a hit on Twitter, with his fans bombarding the site with postings. Kim Hee-chul is a key member of the band Super Junior, known for its boyish looks and synchronized dance routines that have earned them heartthrob status across Asia. His fans declared Monday as “Kim Hee-chul Day” by relentlessly posting Twitter messages on the 27-year-old and drawing a wave of new tweets from curious people with little knowledge of the singer, the Korea Herald newspaper reported Tuesday. Kim subsequently became one of the site’s top trending topics, leading some to compare him with fellow musical heartthrob Justin Bieber. Kim has accumulated over 240,000 Twitter followers, much less than the 16-year-old Canadian’s 5.7 million. But for a period of time Monday and Tuesday, he appeared to rule the site’s Twitter Trends. Kim’s band gained wider fame in August after a YouTube video clip showing a group of dancing Thai policemen impersonating its members became a pop sensation. The officers shimmied and swung their hips in the five-minute video spoof of “Sorry Sorry,” a hit song by Super Junior. This entry was posted on October 16, 2010 by redtofu. It was filed under Boy Band, News and was tagged with kim heechul, Super Junior, Super Junior Heechul.